Erik Martin... I mean ELECTRON BOY! Yesterday I wrote a post about responsibility. True it was in the context of sports owners to their fans. I mean I can’t be too critical (even though I am often overly critical of management/owners) about owners and their teams. Maybe I fall into the “slightly jealous, if I was an owner” camp. To be honest it’s their team, they can do whatever they want with it. But with that right comes the right of me and other diehard fans to criticize you. I mean look, if you own a 1938 Bugatti 57SC Atlantic you can do whatever you want with it. But if you paint it red and have your initials stitched into the seats with a sub that goes boom, then be ready for me to tell you that you are a pitiful owner. Ah, again, thankfully the Sounders FC owners/management aren’t quite like that (current record will most likely lead to gripes soon though). 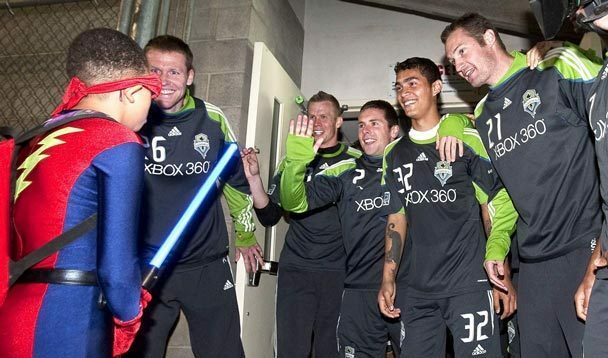 The Sounders FC footballers themselves also care about their fans and the city that supports them. The players were part of Erik Martin’s wish. 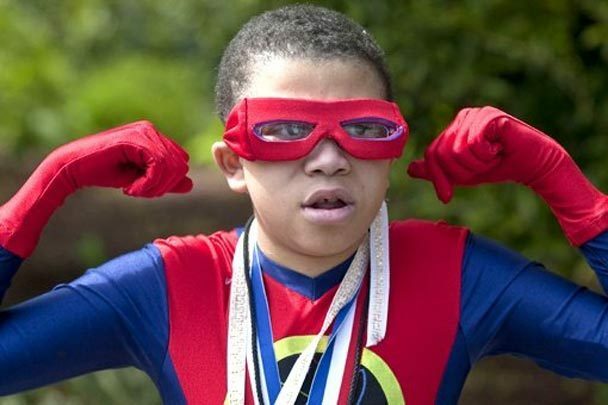 Erik Martin’s wish was a simple one: He wanted to be a superhero. In a society that seems to be lacking a “superhero” there are still heroes in our everyday lives. We all know the extraordinary efforts Make-A-Wish provides those who just live on to the next day is a heroic feat. This day Make-A-Wish granted Erik Martin who was born with a malformed heart, no spleen, and sensory problems to name a few health problems his wish. Erik Martin became Electron Boy. I’ve placed links throughout this post with the entire story, so I won’t rehash it here. It did involve a DeLorean, a limo, tons of fans, a motorcade across Lake Washington, a crane, Qwest Field, the Sounders FC, a few tears, plenty of tears and an incredibly happy 13-year-old. Provided below is a video clip that sums up the heroic day not only for Electron Boy, but exemplified that there is actually good news to report in the world. There are heroes amongst us. We may not be able to rebuild the economy, end war, solve world hunger, and save the environment in one snap of the finger. But daily inspirations and motivations towards others can lead to a greater good. I firmly believe it, every little thing that you may do whether it provide a smile or donate to a charity like Make-A-Wish makes a world of difference. It’s one of those diseases that you hope you can spread. The disease of giving and acting. This story is one of those desktop lamps that I’ve talked about in conversations with some of you. It may be only a small light, but it provides an ability to pen a dream, to type change, to stir emotion that will hopefully resonate with everyone who learns about it. It has already reached across the United States to far corners of the world such as the Czech Republic and Australia. There is even a facebook group titled “Fans of Electron Boy” that has over 9,500 as members. 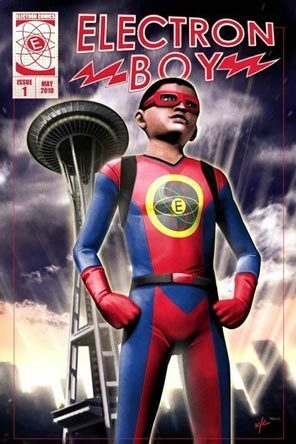 Erik Martin, excuse me Electron Boy, is a superhero in our eyes… but each one of us like all the participants in his wish are desktop lamps. Let’s plug ourselves in and burn a brighter day for someone else. With that, enjoy this clip that reviews Electron Boy’s incredible feat. Warning: goosebumps will occur. (And if they do, then you are definitely a light). This entry was posted in Change, Electron Boy, Erik Martin, facebook, Good Stories, Hero, Heroes, Make-A-Wish Foundation, News Media, Seattle, Seattle Sounders, Seattle Sports, Social Responsibility, Society, Sounders FC, Washington and tagged Bellevue, Bugatti 57SC Atlantic, DeLorean, Electron Boy, Erik Martin, facebook, Hero, Heroes, KOMO News 4, Lake Washington, Make-A-Wish Foundation, Malformed Heart, Media, News Stories, Qwest Field, Seattle, Sensory Problems, Sounders FC, Spleen, Superhero, Washington, Wishes. Bookmark the permalink.